Vol. 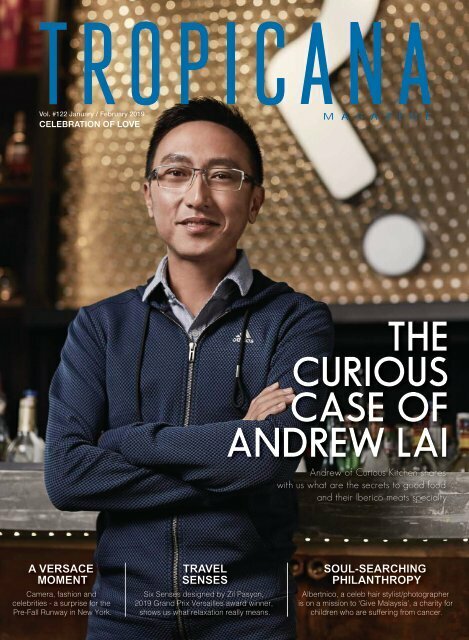 #122 January / February 2019 CELEBRATION OF LOVE THE CURIOUS CASE OF ANDREW LAI Andrew of Curious Kitchen shares with us what are the secrets to good food and their Iberico meats specialty. A VERSACE MOMENT Camera, fashion and celebrities - a surprise for the Pre-Fall Runway in New York. TRAVEL SENSES Six Senses designed by Zil Pasyon, 2019 Grand Prix Versailles award winner, shows us what relaxation really means. SOUL-SEARCHING PHILANTHROPY Albertnico, a celeb hair stylist/photographer is on a mission to ‘Give Malaysia’, a charity for children who are suffering from cancer. COVER STORY other friends to come.